Felicia Prescott is a Behavioral Health Transitional Leader and Coach during key vacancies or during the onboarding of key personnel. Agencies benefit from limited disruption of projects while using an experienced transitional leader. Services include program development and expansion, partnership development, and productivity monitoring. 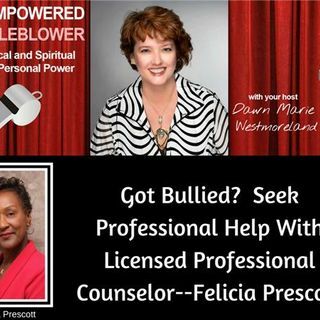 Counselor & Coach- "Workplace Winning" ( Anti workplace bullying and harassment). Helping professionals succeed. Helping successful ... See More professionals manage emotional distress contributed to by negative workplace scenarios. Private Counseling Practice - LPC-Licensed in Georgia and Virginia. Trained Coach, Certified in California.